School buses are the safest mode of motorized transportation for getting children to and from school (NHTSA). 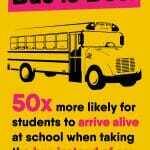 Of the student fatalities that happened during normal school travel hours, 58% of students were traveling with a teen driver, 23% were traveling with an adult driver, and 1% were traveling by school bus (NHTSA). Since 1998, 13 students have been struck and killed by a vehicle while crossing the street to board a school bus in North Carolina. Passing a school bus with a Stop Arm displayed is a minimum $500 fine and 5 points on your license. 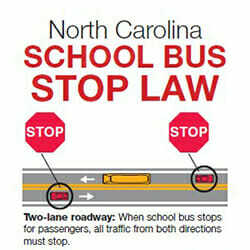 During a one day-count in 2012, NC bus drivers witnessed 3,196 vehicles illegally passing stopped school buses. At the bus stop, stand at least three giant steps away from the approaching bus. After getting off the bus, stay in clear sight of the driver, especially while crossing in front of the bus. 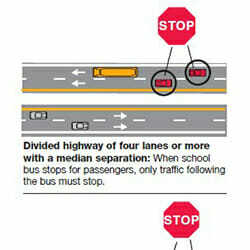 Always watch for oncoming traffic around the bus, including vehicles that may try to get around the stopped bus. While on a school bus, remain seated and facing forward during the entire ride. If you drop something around a school bus, tell the bus driver before picking it up to make sure he or she sees you.